Fisticuffs slot machine from NetEnt takes us back to the golden age of boxing with its quite brilliant old school look and feel. The game perfectly captures the mood with great icons on its 5 reels. There are 20 paylines, a max jackpot of 500x, but unfortunately no bonus rounds or free spins bonus. Check out all the details of this fantastically simple title in the Fisticuffs slot review below. If you remember a time when boxing was a sport contested only by gentlemen, you’ll love the old-school stylings of NetEnt’s Fisticuffs slot – a five-reel, 20 payline slot with two great wild features. An incredibly simple game to play, the Fisticuffs slot machine takes place inside a boxing ring and sees two fighters battle it out to a vaudeville-style soundtrack. The graphics and sound are of the usual high standards that you’d expect from a NetEnt slots title, with all of the higher value icons being appropriately themed. The two boxers can appear on the reels to trigger additional re-spins with locked wilds, with this often resulting in the game paying out some big wins. Playable from as little as £0.20 across all desktop, mobile and tablet devices, the slot boasts a regular base game jackpot of 500x – but that only tells half the story when you consider the huge combination pays that are available throughout. 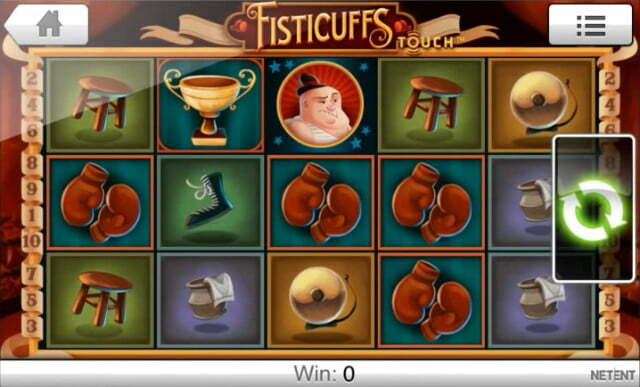 As mentioned above, Fisticuffs is an exceptionally simple slot that benefits from two wild re-spin features. Triggered whenever the two boxers appear on adjacent reels, one of two outcomes can be triggered – either the big guy will punch the little guy across the reels to create a horizontal line of wilds or the little guy will uppercut the big guy to create a diagonal line before a free re-spin occurs. With all wilds remaining locked in place during this re-spin, players will obviously have the chance to land some big payout combinations – particularly in the case of the horizontal line of wilds as, at the very least, this will create a four-of-a-kind combo that could be even bigger thanks to regular wilds. What’s more, the 20 fixed paylines in the Fisticuffs slot pay from both left-to-right and right-to-left, meaning whichever way the boxers punch each other, you’ll be able to benefit from the wilds that they leave in their wake. All this adds up to a slot that is capable of paying out a maximum jackpot of 100,000 coins on any given spin; an amount that belies the game’s relatively small 500x top line bet payout. A simple and addictive game, NetEnt’s Fisticuffs slot is capable of some staggering payouts, but can perhaps be accused of lacking the depth found in some of the studio’s more popular video slot titles. Like the Fisticuffs slot review? Check out these as well…..